St. Andre is one of our newest Saints. He was declared a Saint, by Pope Benedict XVI, on October 17,2010. St. Andre was poor, an orphan at age 9, frail, and simple. It was thought that he was not smart enough or healthy enough to be a priest. The priest who recommended him told the Brothers of the Holy Cross that he was sending him a saint. But they were not impressed by the young man who could barely write his name. Through the intercession of the Archbishop of Montreal and the recommendation of the Priest in charge of the novitiates, he was allowed to take final vows. You can read about this saintly man, who had a devotion to St. Joseph, do go read about him here. I really liked the video about Saint Bessette. 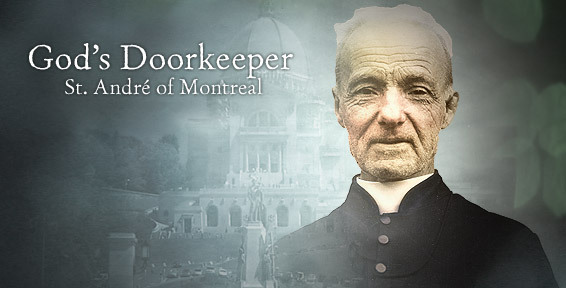 Amazing that he was the doorkeeper.